When newly widowed Kate Hamilton gets a call from her former sister-in-law begging her to come to Scotland, she can’t refuse. Her late husband was always his sister’s buffer between whatever problems she had, and now Kate takes over that job. She arrives at the Isle of Glenroth in time for the Tartan Ball, an annual end-of-autumn gala. She doesn’t tell Eleanor, of course. Later never comes, for at the Ball, Eleanor makes two announcements. She’s selling Glenroth House to a Swiss hotel company, and she’s marrying Hugh Guthrie, local writer of a best-eller based on an unsolved murder that happened over 200 years before. Both announcements are greeted with shock and anger. Several guests walk out in outrage. Later that night, Eleanor is murdered, and Kate wonders if the premonition she felt when she touched the casque heralded Eleanor’s death or something to come. A local handyman confesses and is arrested for the crime, but Kate doesn’t believe he’s responsible. The police investigate with the assistance of a guest, visiting Detective Inspector Thomas Mallory, from Bury St. Edmund. Kate and Tom have already met, in a minor fender bender the day she arrived, and the Inspector is more than interested in the visiting American lady. He isn’t happy when Kate decides to do her own investigating, however, but Kate, remembering her late sister-in-law’s selfish habits, doesn’t let that stop her. Kate is certain Eleanor’s death has something to do with the so-called “Arnott curse,” stemming from the murder 200 years before of Flora Arnott and her maid by persons unknown, and the murder a year later of her husband. Eleanor had given Kate a copy of Hugh’s book before she was killed. With hints of ghostly doings at the hotel, someone invading her guest cottage but stealing nothing, and another murder, Kate steps up her digging into ancient history as well as Eleanor’s more recent one, looking for motives. A good many people might’ve wanted Eleanor dead. Hugh Guthrie’s mother, for instance, not liking Eleanor luring away her son; the Arnott sisters, who insist they are the legal owners of Glenroth House; or even one of the staff members who may lose a livelihood when the new owners take possession. Of them all, one person in particular suddenly stands out as highly suspicious. Remembering a scandal when Eleanor was a teacher and lost her position over a love affair, Kate discovers Tom Mallory is the son of the man involved. How would that relate to the murder of Flora Arnott, and the missing casque? Why would Tom wait so long for his revenge? Kate is in for more than a shock when she discovers the truth, for it may mean she’ll be joining her late sister-in-law in the Hereafter. Told from Kate’s point-of view, this is an easy read and an intriguing mystery novel delving into ancient history as well more recent events. The mentions of Bonnie Prince Charlie’s presence in the area will have readers accessing online encyclopedia to learn more of that historical event. Kate’s reminisces of her late husband and their trips to Scotland as well as the event leading to his death are poignant without becoming maudlin, and her worry over her attraction to Tom are heartfelt as well as realistic as she admits she’ll always love her late husband but she’s still very much alive and ready to move on. Her agonizing over Tom’s possibility of being involved in Eleanor’s death adds extra fuel to the emotion she feels for the inspector. 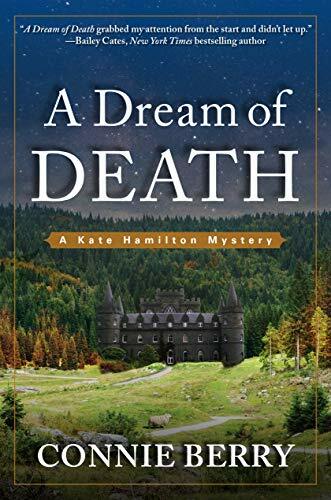 A Dream of Death is a cozy mystery but nevertheless an exciting one, with tense and tough moments, aided by its rugged Scottish setting and the author’s entertaining unravelling of the plot.